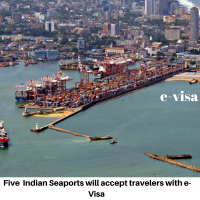 India’s five major seaports – Kochi, Mangalore, Chennai, Goa and Mumbai will now accept foreign travelers who possess e – Visa with them. The present facility is available at 16 airports. The initiative to liberalize travel visa helps patients who come for treatment and business purposes. For them the visa processed within 48 hours. Immigration counters will be set up at all the five seaports to assist medical tourists coming to India. The new policies allow the tourists to apply for visa, before four months and can stay up to 60 days in India. The popular e-visa scheme was introduced on November 27, 2014. The applicants will receive an email of the approved e-visa. The print copy of authorized email acts as an e-visa. The authorities concerned will stamp on the e-visa, after arrival in India. The e-visa facility is extended to 150 countries. On an average, everyday 3500 e-Visa are issued on daily basis.